Masculinity…. young or old, we are issued a challenge to authentic masculinity. St Joseph provides a model and a method for Knights to succeed. The result is not a question but a description of our brotherhood of Knights and this week find it in several college Knights. Knights celebrate St Joseph whose feast day we will soon observe. 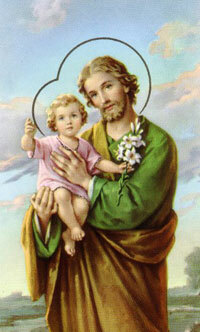 St Joseph provides an example of selfless giving putting Jesus and Mary’s needs before his own as a father and husband. Knights are men who desire to die to self in order to live for others as St Joseph did and therein find Jesus Christ. Both St Joseph & Jesus himself show us the way to true masculinity. The Knights are a wonderful avenue to allow anyone – young and old to give back in unity; and in so doing build virtuous and upright lives. That certainly is the model of St Joseph and the desire of our founder Fr Michael McGivney for Catholic men. Just as St Joseph had many cares, husbands and fathers today do also. Being a Knight encourages and supports such men in their vocation to be the best fathers, husbands and Catholic men grace allows. Because its often older men who are more visibly involved in many parishes we may see the Knights as an older man’s fraternity. However the Knights may have more to offer younger men as they start career, marriage and family. Iowa Knights are currently promoting an Under 40 for Lent recruiting initiative to focus on inviting young men to consider membership. In that theme we visit with several young Knights about the attraction and benefits of membership in the Knights. I recall an interview a couple of years ago with Travis Risvold of the Granger council in which he shares his thoughts about what is appealing to young men about the Knights. I’m always struck by that phrase – I’m no unicorn. Travis rightly points out he is right here in our midst and not some mythical creature. We need each other to enable the give back. In Iowa we have some wonderful college councils where young men have the opportunity to not only give back but build connections for a lifetime. I was privileged on the first week of February to attend IROCK – the Iowa Rally of College councils where I met several interesting and inspiring Knight leaders – all of whom are college men. If anyone was a unicorn that day perhaps it was myself as the oldest Knight in the room. College Councils build friendships, build connections, and build leaders for life. I’m enthused that Zach plans to seek out a council home in his new city. Attendees at IROCK this year hailed from UNI, Drake and host Iowa State. One man who was eager and outspoken is a senior at Drake with good prospects after graduation. Johnathon Fortino shares his insights on the Knights, on the importance of leadership and on his faith focus. Johnathon Fortino certainly has spent reflective time considering what is truly important and his faith is on top. I can remember as a college student searching for a place to fit in that also supported my faith. I don’t think I was ever able to balance those two needs nearly as well as many of these college Knights. Frankly I’ve always been impressed with their depth of spirituality, insight and enthusiasm. My next guest is no exception. The men at Ames have a bright future and are in good hands I think. Steve Hesprich gives us a reflection upon St Joseph this week. What is your definition of a real man’s man? What does authentic masculinity mean? We look to St Joseph as a model. Iowa Knight Life 2014-07-02 IROCK-2! This week on Knight Life we continue the two part series from the Iowa Rally of College Knights (IROCK-2!). We hear from some of the members who attended I-ROCK! on the works undertaken at their schools this past year. We also hear another edition of Knights to Christ from Steve Hesprich for reflection and spiritual connection to our principles. Zack Jakaitis hosts another week of Knight Life which follows up from last week’s discussion on (IROCK!) the Iowa Rally of College Knights. Zach is transitioning out of the role of College Advisor for the State of Iowa Knights of Columbus and looks back at the IROCK! weekends over the past six years. He sees the true benefits that have come from gathering together the young minds of our order here in the state and being able to sit down and talk about how they can be more effective at their council, community, and even state level. The young knights of our order are excited and ready to take on new challenges that face them. The college program gears them to be effect leaders with the order by instilling in them the Leaders for Life Ideology. While some activities you can join during your college years let you be a part of team or club for the time at your school; the Knights of Columbus College Council Program gets you started on your way to join an “experience of a lifetime”. To listen to the full podcast or selected stories click on the book stack in the player below, select a track and click the play arrow. Being able to get together and share ideas of what is going on with your council through a convention or district meeting is a great benefit, but for our college councils their availability to get together as a group only happens once a year at the Iowa Rally of College Knights. This year we were able to hear from Drake University, Iowa State University, University of Northern Iowa, and the host for that weekend Loras College. Although you will hear from each of those college’s the Iowa Knights of Columbus College Council Program is also available at University of Iowa, St. Ambrose University, and Briar Cliff University. Also if there is a college that you would like to see become active, talk to a local Knights of Columbus group or local priest and they can help point you in the right direction. The first group we hear from are two gentlemen Dylan and James from Drake University. One of the things they talk about is their involvement in other councils as a huge benefit for the college council. The ability to have support from the Knight’s councils in the area can help keep a program growing and will also help with the college knights transitioning out into the working world. When then hear from Loras College Knights. As the Host of this year’s IROCK and Colin and Josh were able to show the visiting knights first-hand how they operated as a council on campus as well as in the Dubuque community. Iowa State is one of the “Newer College Councils” in the program and Christopher the deputy Grand Knight brought out the student/community member partnership that they have going on in Ames today. UNI also has the benefit for having a mix of community members as well as students. They Chrs and Travis talk about a program, their Ultra Sound Initiative that won the State of Iowa Culture of Life award at this past State Convention. Travis will be taking up the reins of College Council Program Advisor for this fraternal year and I am confident that he will do a tremendous job. The College Council Program has already put together great leaders in the state of Iowa Knights of Columbus members such as Adam Bormann who is a current district deputy out in Davenport, Paul Lee who sits on the state executive committee, and Isaac Doucette who is Grand Knight down in Iowa City at council 842. The college council program is a way to bring young members to the leadership of the future of our order. It has been my pleasure being able to serve as the college advisor for those years and I look forward to the challenges ahead. It is always a pleasure doing Knight Life and we want to thank all of those who are involved with its production and encourage councils around the state to end us your stories to help share the great works that we are doing with this part of the world god entrusted to us. Thank you to those who I interviewed this week and thank you to all of those who helped put this together This is Zack Jakaitis for Knight Life. Our Mission is to serve god’s people. Knight Life is a presentation of the Iowa Knights of Columbus. We are 31,500 men working for the good of our parishes, communities, state, nation and world. Think about joining us. We do good works for others and together we become the men God created us to be. We pray for strength and guidance from God to do what is right for every man, woman, child and unborn child. Iowa Knight Life 2014-06-25 IROCK! This week on Knight Life, we look back on one event put together by our State Council for our college Knights, the annual Iowa Rally of College Knights to gather together to share ideas and talk about programs they are doing on their respective campuses. We start this two-part series off with hearing from the Chaplain of the Loras College, Father Robert Gross on his welcome to those in attendance and then we will hear from some of the participants from the different colleges around the state and finish up today’s episode hearing from Steve Hesprich and his reading from Knights to Christ. Hello again this is Zack Jakaitis doing another week of Knight Life. This is a busy time of year for the Knights of Columbus coming to a close of our fraternal year on June 30th and getting ready to start off another year of growth and evangelization for our program. As I stated before this week we are looking back onto the College Convention which was held in Dubuque this year. The Iowa Rally of College Knights or I-ROCK! as it is dubbed has been a program that has grown in size and reach since it was first started in Dubuque around 6 years ago. This was my last year as the College Council Program adviser so it was a very special year to make sure that we were able to get together and talk about where the college program has come from with the great works our schools have accomplished and we also gathered to share input on how we are able to make an impact for the future, not only at our college campuses but in our communities around Iowa and the United States. Fr. Robert Gross, the Loras Chaplain started out our conference with a prayer and was able to talk to us about being a true man and a true knight and what that means. At I-ROCK this year we were grateful to have a representative of the supreme office. Bobby Rauch is a past grand knight of the oldest college council 1477 at Notre Dame He joined the convention to share his insight of the program and his path through the Knights of Columbus. It is always a great reminder for our councils to remember the true bond that ties us all together as Knights, whether across the state of Iowa or the world and that is our Church. One thing that we must be mindful is that as Knights it is our responsibility to reach out those around our church and community and invite them to join our organization. As Knights we are helping to be the best Catholics that we can be and with that we should be reaching out to others that need to help to join us in our mission. On next week’s show we will hear from the College Councils that were at the Iowa Rally of College Knights and get to hear about the great work that they have done. It is always a pleasure doing Knight Life and we want to thank all of those who are involved with its production and encourage councils around the state to end us your stories to help share the great works that we are doing with this part of the world god entrusted to us. Thank you to those who I interviewed this week and thank you to all of those who helped put this together. This is Zack Jakaitis for Knight Life. Our Mission is to serve God’s people.